The SC-310 Series Timing Relay modules provide convenient, programmable timing control functionality for a large range of applications. The module may be easily field configured (and re-configured) on demand for control input voltage type, timer delay modes, time measurement units and timing increments. The SC-310 incorporates an extremely accurate microprocessor-based digital timing circuit for repeatable reliability and long life. In addition, each module includes a dual color LED, which provides visual status of control input voltage, timer circuitry activation and relay contact state. Automatic timer reset is accomplished by simply removing and/or momentarily interrupting the control input voltage. Timing relays may be used in cascaded and paralleled configurations (and/or matrixes of both) for nearly endless custom application functionality. 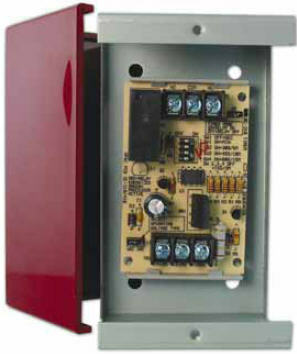 The SC-310 Series Timing Relay is suitable for Fire Alarm, Security, Access Control, CCTV, HVAC, Industrial Process Control, Energy Management, Lighting Control and general purpose applications. The SC-310 Series Timing Relay modules provide convenient, programmable timing control functionality for a large range of applications.